High Impact Short Books are a unique type of business book I’ve developed for business owners looking to tap into the magic of having their own book working for them. These short books, or “shooks™” as I call them, are powerful, high impact customer-attraction books which follow a specific content and design architecture I have developed. Interested in working with me to publish a shook? 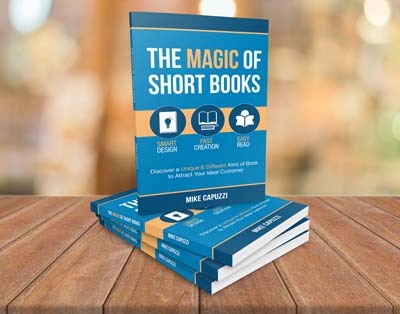 Get my High Impact Short Books Information Kit which contains an autographed copy of The Magic of Short Books + a valuable training on the power of customer-attraction short books + a bunch of other goodies!